This is a super fast way to make a costume. It took me less then an hour to do the entire thing and about 20 min to do the skirt. 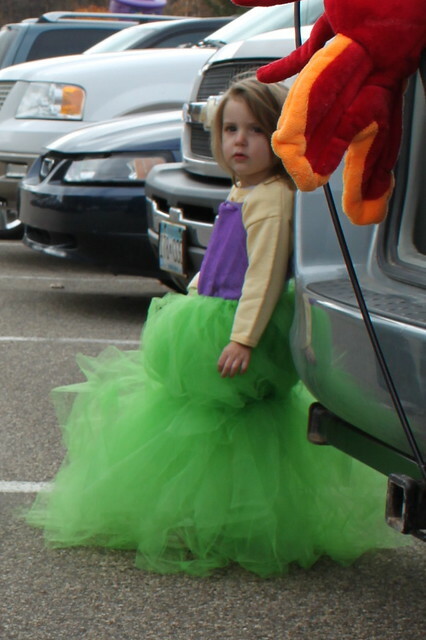 You could make a mermaid tail out of any color, but, green is the most recognizable ‘tail’ color. I went to the local big fabric store and got 20 yards and that was 2x more then I actually needed for Zoe BUT she is short and thin so I was able to get the length I needed from just the width of the fabric. 1. 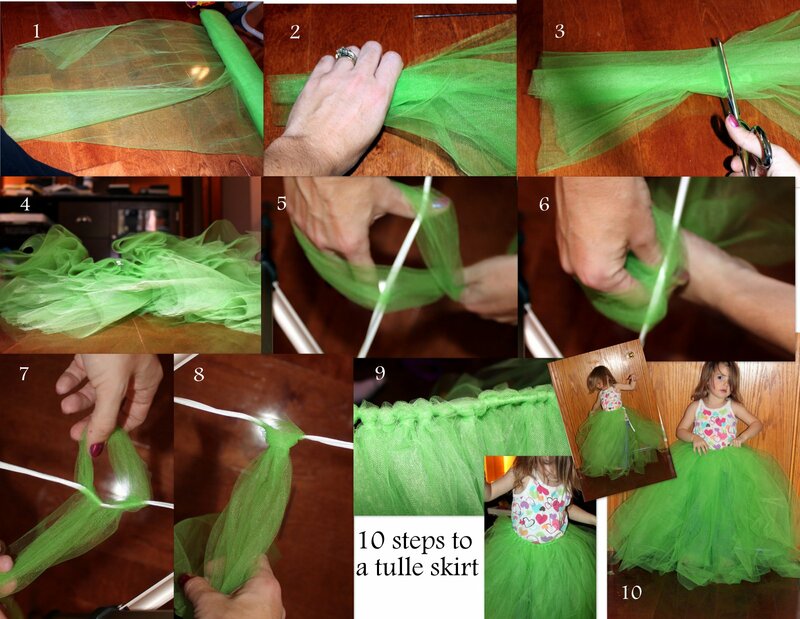 Lay out your tulle in a fairly open area/table so you can unroll it as needed. DON”T unroll it all first, it makes a huge mess and is hard to roll up again. 2. Gather it up in one hand keeping it reasonably straight – I used my left since my right hand would be doing the cutting. It is way easier to gather it up and cut in one big cut (in my opinion) then it is to cut a straight line with it all flat like normal fabric. The edges are not perfect, but, that does not matter for a full tutu style skirt so trust me, save the time and don’t stress about super straight. 3. Cut it! I decided mine should be 4 inches wide so that equals two of my floor boards – experiment with width and then make a guide so you don’t have to measure every time. ** the picture shows me just cutting but that is because I had the camera in my hand. Keep a hold of the fabric in one hand and cut with the other. cut a piece of ribbon (or elastic, or a length of tulle) equal to the waist of the mermaid plus a few inches to make a bow then tie it to something sturdy. The skirt is a series of slip knots around the ribbon so 5-8 are an explanation of a slip knot so if you already know how just skip to 9. 5. find the center of your tulle and put it over your wrist with your hand facing in (toward your ribbon). Your other hand is holding the two half’s of the tulle. The ribbon should be under your tulle right now. 7. Pull the tulle up through the loop your hand was in. My picture shows me holding the loop out but you don’t have to. Your tulle is now wrapped around the ribbon. 9. Keep repeating until you fill the length of the mermaids waist leaving two equal empty parts of ribbon on either side so you can tie a bow. Push the knots as tight together as possible so you get a very full skirt. 10. Tie on the skirt and let her spin! To make this a mermaid tail tie a length of tulle or a coordinating ribbon about knee level and puff above the tie slightly. This makes it look like a tail and is still easy enough to walk in. I’ll add a better picture of this tomorrow – my model went to sleep but this is from the weekend. ~ If you are doing this for a taller person you should cut your tulle long ways first to equal 2x waist to floor of the person, then, cut each into 4 inch strips. ~ If your mermaid has no hips (like all kids) the tail starts to slip down. I solved this by looping the bow from the back of the tail to the tie on her top making an X on her back. Not super pretty but it did the job. Using elastic might help this. Tomorrow the top but really, it is a tube top with a ribbon hauler tie. I made the top very long so when the ‘tail’ is removed she still has a costume on. OH MY GOSH this is too adorable!